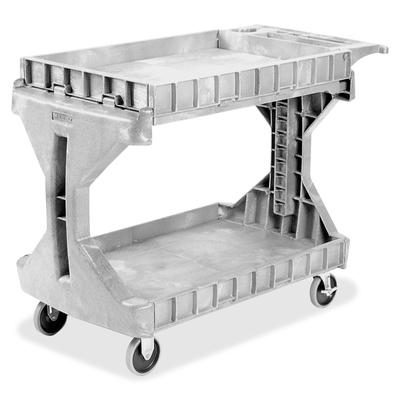 Procart Is A Versatile Utility Cart. Hinged Side Gates Allow The Cart To Convert From A Flat Top To A Box Top On The Fly. Raise Gates To Contain Items On Shelves During Transport. Lower To Easily Slide Items Off. Structural Foam Plastic Construction Is Dent-Resistant And Rustproof. Deep, Molded-In Storage Compartments Are Perfect For Small Items And Your Coffee Cup. Utility Cart Holds Up To 400 Lb. Weight. Storage Bins Are Sold Separately..
Procart Is A Versatile Utility Cart. Hinged Side Gates Allow The Cart To Convert From A Flat Top To A Box Top On The Fly. Raise Gates To Contain Items On Shelves During Transport; Lower To Easily Slide Items Off. Structural Foam Plastic Construction Is Dent-Resistant And Rustproof. Deep, Molded-In Storage Compartments Are Perfect For Small Items And Your Coffee Cup. Utility Cart Holds Up To 400 Lb. Weight. Storage Bins Are Sold Separately.